"....Your book is AWESOME! I love it! But wow, you all tell too much!!! 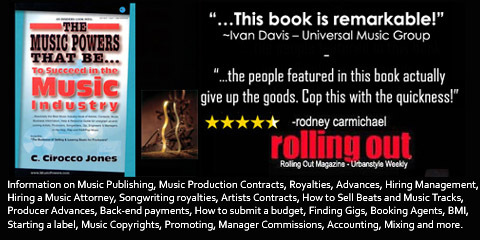 (lol)"
The Music Powers book you wrote shows you care about artists especially the new and upcoming, The book give tips coming from the best of the best in the music industry + it includes " the hookups " most artist are dreaming about, when i was looking over the sneak preview i was like my goodness, now those are hookups, and tips! …and only for a 20 euro?, its nothing really… comparing what people are getting from music powers, I’m pretty sure that everyone who is a 100% dedicated to their music career will buy it. I spent over $30,000 A year studying music business at a large school in Boston, and honestly - I probably absorbed more from this one particular book than any of the required text assigned to me at that school. Thanks for all of this info from this wonderful book! I don't think I would have made it to where I am today without it. I used principles you wrote about in your book and they have helped me to promote myself in my city and I became rather popular in my city and already have gig invitations from other cities. So your book is absolutely great! I just started my website addressed to ALL Music World and just as my “Thanks” to you and your book, I’ve posted a banner on the Music Wall! Thank you. That is all I wanted to say! Ü I just want to let you all know, that I cannot stop reading your book!!! I have read several books over the years on the music industry, and yours is by far the MOST comprehensive, and most specific to urban music EVER WRITTEN! I have read Kashif's book, and the “All You Need To Know” series from Passman, “This Business Of Music”, and so on, but the Music Powers book ain’t nothing but the truth! For as much as I thought I knew about the business, just reading the track on slangin’ beats was enlightening. Then to cover every aspect of the game from producing to engineering, to publishing is perfect for me, cuz thaz what I do. And another thing that's hot is the industry contacts. Attorneys, managers - Emails and fax numbers, thats what up. I'm pissed cuz I bought this big azz industry source book (Recording Industry Sourcebook) bout 5 years ago cost me close to $100 and it ain’t nearly as tight as yours. I'm glad someone stepped up to empower us out here trying to make it in this crazy game. Thank you, now let me get back to the reading. I have to say thank you for what you done. You made a book that cannot be touched. You not only explain the biz you explain production and the whole nine. This book is a must read for anybody that is thinking of this biz. I have read numerous books on the industry nothing can touch yours. You are doing folks a real service. Thanks for doing this for someone that had so many questions. God Bless. I will see you at the top. Music Powers is the only book of it's kind in that it covers all aspects of Music business, production, mixing, contracts and contacts. This is also the only book I've seen that covers "selling beats" specifically. Thanks. Ü After my daughter signed a major recording contract at the age of 14, we became over-whelmed with many issues pertaining to her career. We questioned ourselves on many issues; did we hire the right attorney? Did we sign with the right label, issues with producers to bring in, matters with creative control that the label had over artist. I'd bought and read many books concerning all aspects of the music business, many of these books never really gave detailed answers on how to get this done, how to get that done. These books only covered the basics, which I already knew. Then I walked into Barnes & Noble to find what I call the "bible of the music business" The Music Powers That Be written by C. Cirocco Jones. I can truly say that this book is with me day and night. The Music Powers book also allows my daughter, Adraine aka A.O. of Music-Line/Capitol Records to read and understand this business a lot more than she had. I have and will continue to recommend this book to anyone working in the music industry. I want to say thanks once again for your book because it gave me the confidence to step out on faith and be heard. An independent female hip hop group in Atlanta has chosen some of my tracks to be used on their album scheduled to drop in June. 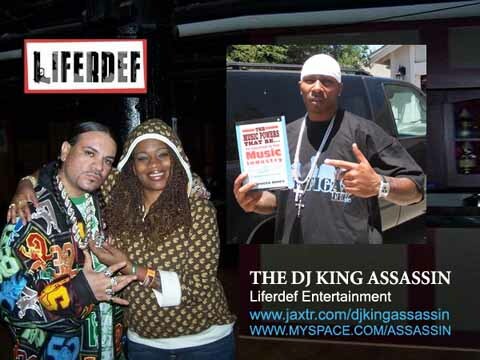 Just wanted to touch base with you and let you know your book is a very important factor in my music career. I’m now an artist with The Drum Squad (Young Jeezy, Boyz N Tha Hood, Paul Wall, Rick Ross), and I am also working with people from Playa G India Arie, Sony Music, Universal Music, and too many others to list. I owe you a debt of gratitude. Ü THANKS FOR THE BOOK! I really, really, REALLY thank you for writing such a wonderful book and I'm sure that it will be a industry reference source for many years to come. I came all the way to Atlanta from Paris, France to go to the HCIBD music conference and I got your book. I can say that it is a great read!!! Thank you putting this out there. Every aspect of the industry is addressed and all of the info comes from very reputable sources. The book that you provide gives us everything we need to continue to grow in our careers. This is Professor Griff (Public Enemy), i read your book, and it is informative, very visual, easy to read, and right on point. ü THANK YOU! Thank you so much for the prompt delivery of the pdf version of the book. This is truly an amazing book. I read through almost the whole thing today. I am truly grateful for this information and will pass your website on to those I know can use it. God bless you. This book has cleared up so many questions I have had about the music business. WELL WORTH THE MONEY! ü Music powers - i luv everything!!! First of all, I want to say thank you for sending me the 200 page pre-view of the music power book. I have learned a lot just from the pre-view alone. I am eager to see how even more fascinating the book is going to be. At first when I had received the e-mail from you guys, I thought that it was just another group of individuals out there scheming people, but I took a risk anyway, and pre-ordered the book online the same day. Now, having received feedback from my staff, it makes me feel good for deciding wisely, because if I didn’t, I would have been left out of this great opportunity. Thank You. "...This is without a doubt the best thing going around in the music industry. Keep up the excellent work!!!" ü Kudos! Thanks so much! Just wanted to say that I've already started reading and this is exactly what I was looking for! Most of the books in my music library are good references, but it’s hard to derive an application for my particular situation. My guess is that these authors are sticking to what they know - which would be rock, pop, and other genres. I like the way that Music Powers incorporates the information from these references and makes it applicable to those who want to pursue a career in the urban/hip hop/r&b genre. It kind of reminds me of how when I was growing up in Atlanta, there would be all of these events catered to the African American populous (Weddings for us, Black Expo, etc). This book should have been entitled "The Music Business - for us." (haha) I can truly appreciate how this book provides a sort of relevance to all of the "music business" references and guides out there. Ü I would like to first off say thank you for every thing you've done so far. What you sent to me was much more then what I had hoped it was gonna be. I mean come on how many of use would have been able to get that list of managers let alone to get a lawyer that reps Sony to answer questions for us. This was nice I'm still reading, the list, and some the finance stuff in there this is worth its weight in gold. Defiantly a book that every body should have in there studio, rest rooms, bed rooms, kitchen, and on the coffee table. I had a musicians almanac one point and time, but just from what I've read, the snippets of interviews you have sent to me man I have learned a lot about the business side of music that I would not have learned until I really was in the biz. Good looking Music Powers - thank you for putting together the best tool I could have ever got this is more important then any mixer any Mic or any studio you could have. I mean those are very important for your music, but what are you gonna do with your music if you don't have the tools and knowledge of were to send them how to present and who to get it to. This is the best money I will ever spend on any thing music related. Thank you music powers. I purchased a book from you guys, It's the best damn book on the market. I'm happy I found you guys from just surfing the internet. More people need this information.